Last month, I asked for your thoughts and opinions, and you shocked me with a ton of positivity and even better, helpful criticism! Thanks so much for that, I sure appreciate each and every 267 of you who took my survey and told me what you thought about this little old young blog! Since I’m sure you’re dying of curiosity (or maybe you’re not, that’s cool) I thought I’d share the results of my survey, and my thoughts on what you had to say! I promise I’m not throwing anyone under the bus (it was anonymous, after all) but I may or may not be responding to some of your comments and critiques below. Surprise surprise, the majority of you around my age (18-30) and female. 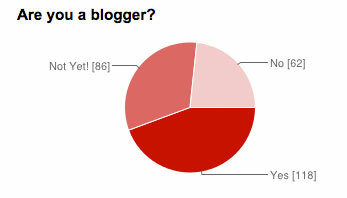 I was surprised to see how many of you are aspiring bloggers! And I’m pleased to see non-bloggers participating in this survey – thank you so much! So happy to see my favorite posts are yours too! 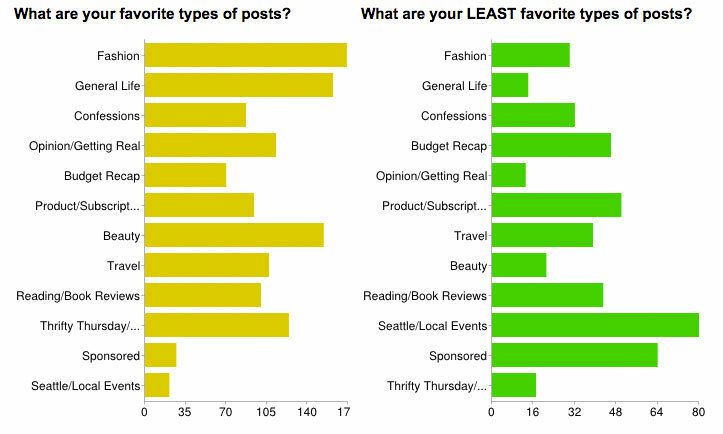 (Fashion, life, and beauty) But am surprised to see that budget recaps and book reviews are pretty high on the least favorites list! I figured local events may not be interesting to a lot of you, so those will mainly be showing up on Instagram in the moment instead of on the blog. Okay, I am so shocked you guys want to see cooking posts. I actually kind of hate cooking, but absolutely love baking! I just don’t have much time for it, but I will definitely consider sharing some recipes in the future and see how it goes. And Rigby will definitely be making more appearances around here, because obviously you’d like to see that too. So tell me, what type of dog posts would you like to see? I’m pleased to see that overall, you seem to like the content on here! And so glad that you want to see posts 3-4 times a week, because that’s what I’m doing currently and it seems to work best for me too. I was shocked that a lot of you actually follow me (and prefer to do so) on Facebook! It’s something I feel like I’ve neglected, so I’ll work on getting my social sharing on there a little more consistent. Hi new readers, a lot of you found me for the first time during my one year blogiversary! Happy to have you and hope you stuck around ;) It seems like the rest of you hang out here once to a couple of times a week so that’s great! As for advertising, the consensus is that there’s not enough interest for me to offer it, and to be perfectly honest, I’m not sure I have time to dedicate to paid sponsors/advertisers. Needless to say, if you want to do a swap or work together on a post, email me anytime! I also discovered that you guys are content with my current WordPress comment system (72% of you, anyways!) so I will be leaving good enough alone. And now… time to share some of your comments! “The picture quality and writing quality featured throughout.” – Yay, I love this! I got a few comments about the photos and so glad you like them. “You are absolutely adorable and so is Rigby!” – Blushing over here. Thank you, and Rigby says thanks too! “That Rigby is your dog.” – Haha, me too! “The simplicity! I cannot stand blogs that are covered in a million designs and ads. Your simplicity is so refreshing, and lets me read without getting a headache!” – As a designer (my day job), I’m so glad to hear that! I try to keep things as simple as possible since I think the content is the important part! “it’s a real, down to earth blog. none of that crazy high fashion stuff no one really likes, they’re just supposed to because it’s high end.” – HA, cracking up so hard over this. I know what you mean, and am glad to hear it! “MORE RIGBY. Actually, can I just come over and hug him? Thanks so much :)” – Haha, this wasn’t bad, but definitely something I will be working on adding more of in the future! “I’d like to see more haul posts!” – Interesting, and definitely something I can consider doing on YouTube! “A little random some time, there doesn’t seem to be a real theme” – This is valid, I do have a lot of interests and so I blog about all of them! It’s hard to narrow it down, but it’s something I’m working on and will continue to work on. “A bit picture heavy sometimes” – I will definitely make sure that photos are useful before I add them! Great feedback. “Not much a fan for book reviews.” – Eek, I saw this a few times, and so sorry if you’re not a fellow book nerd, but I promise to keep these to once a month and not become a book blogger! Ain’t no one got time to read that much. “Would love an easier navigation between categories/etc.” – I so know I need to do this. My goal for October is to get a mini redesign done which includes a better navigation system! “I generally not a fan of sponsored posts. I have never seen a sponsored post on any blog that wasn’t glowingly positive. I don’t trust them and don’t bother with them.” – I totally know what you mean! But I will say, the reason my reviews tend to be positive is because I only will work with brands whose products I either 1. already use, or 2. have tried and actually liked/agree with. I hate writing about things I’m not a fan of, unless it’s a part of a beauty box in which case it’s no biggie if it didn’t work for me. “Budget report. Shouldn’t that be personal.” – This is super interesting to me and I actually thought a lot about this particular comment. I personally don’t find talking about my budget to be extremely personal, but I can understand where others may think it is. I try to be discerning with my purchases, and may take the money component out of future monthly posts. This was so interesting for me to read and SUPER helpful! I need to think more about the category comment, and you’ve inspired me to put together a little survey! I’m pretty done with giveaways, I enter them with the blogs I follow but I don’t really follow people I don’t follow, if that makes sense. That’s odd about the budget, I think if we were discussing actual finances like bills and mortgages that would be personal, but isn’t it the same as linking to a pair of jeans that you bought, we can see how much they were, so whats the difference in putting it all together? It certainly opened my eyes. Absolutely, and I do the same for the most part. Occasionally if I have time I will click through to see what they’re about and sometimes I find new reads that way, but generally I just don’t have the time for the crazy giveaways anymore! Yeah, the only thing I can think is perhaps how much I’m spending is too much in some people’s opinion and comes off as humble bragging? I’m not sure, but I’d absolutely love to know more! 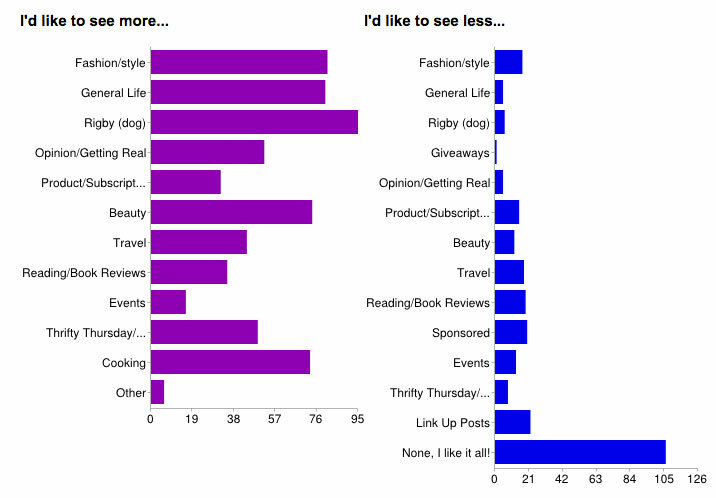 I don’t blog but treading the results of your survey was really interesting. I am sort of blown away by a couple of the comments. People don’t pull punches do they? Thanks for sharing all the results– I always love reading what other bloggers or readers like to see when they come to a blog! Glad it was helpful, I enjoy reading survey results on other blogs too! hmm the budget report comment is a bit off to me. I actually really like them and also don’t find it to be personal. It’s nice to see what others are allocating towards certain things as I am learning to budget for my Fiancé and myself. Glad you like them – and they won’t be going away! I don’t find them personal either, but I could see them being potentially difficult to relate to if you don’t care about shopping for clothes, for instance. “I hate the giveaways where you link with a million blogs. It’s so time consuming I don’t even enter them. I’m here for your blog.. not theirs.” Okay, so don’t enter? LOL. I’ve had some people comment on how many entries there are in a rafflecopter, but I try to explain that the prizes will be smaller with fewer blogs… Oh, and you don’t have to do every single entry, either. Yep, totally true. I can see what she (or he) means though – some of the giveaways can get crazy long and overwhelming! Its good feedback to know that not everyone appreciates those type of giveaways though, and doesn’t mean I won’t participate, just maybe will give it a second thought. I loved the survey, I thought your questions were really interesting and thought provoking, I’m glad you were able to get some good content and strategy ideas from the results!!! Thanks Jamie, glad you enjoyed the survey! I definitely spent some time paring down questions and asking the ones that I really wanted the most… otherwise the survey could have been much longer, haha! 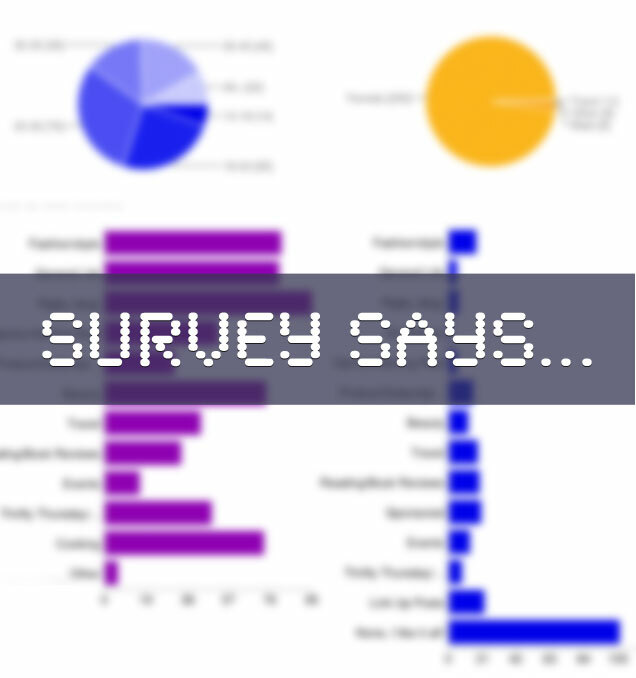 Thanks for sharing the results of the survey. And thank you for this giveaway opportunity. Hope you have a great day !! Of course, and thanks so much Christy! Hope you have a great one too! Haha, yes that is true, but I assume what they mean is that they its unclear what topics I do cover in my “lifestyle” blog. Some lifestyle blogs cover food and fitness, for instance, which are things I don’t really write about. I think if I categorize my posts in my navigation a little better that might be helpful! This post was so interesting to read because I also found some of the graph results surprising! Haha that’s awesome! Thanks for the good feedback, whichever it was! ;) And yeah, the thing that surprised me the most was cooking. I think I have only posted one recipe ever, so color me shocked! Those are great results! I can’t believe over half of the responders were not bloggers! Honestly I was surprised too! I figured bloggers would understand the value and be the ones filling it out, so I was thrilled to see that wasn’t so! So interesting to see how other people feel. I love the budget posts. I don’t really give myself a budget, but try and be frugal and find it interesting to see the choices other people make. I took part in the survey and I am very happy you posted the results. It is very interesting!